We were semi-successful. Myself and Robert Taylor managed to climb the north face of Muz Tok, but our way up the ridge to the summit was blocked by a short rock wall which we could not get up. Red – our route up the face. We started climbing at 1am, climbed all night and all day. It was possible to move onto rock sections mid-morning to continue climbing all day even though snow conditions were deteriorating. We reached a bivvy at the top of the red line as night was falling. The next morning we set off up the ridge at 1am but after a series of Andean-style snow flutings arrived at a short (just ~20m high) rock wall which we could not get up (yellow line). We descended back to the bivvy then down the couloir behind the face (green line). The descent involved 4 abseils then the rest was downclimbing on ice / neve. For me, the ascent was a once-in-a-lifetime level of difficulty. What we climbed was about 800m of ascent. The bottom of the face is 4150m, our bivvy was at 4928m, our high point was at 4971m (GPS measurements). 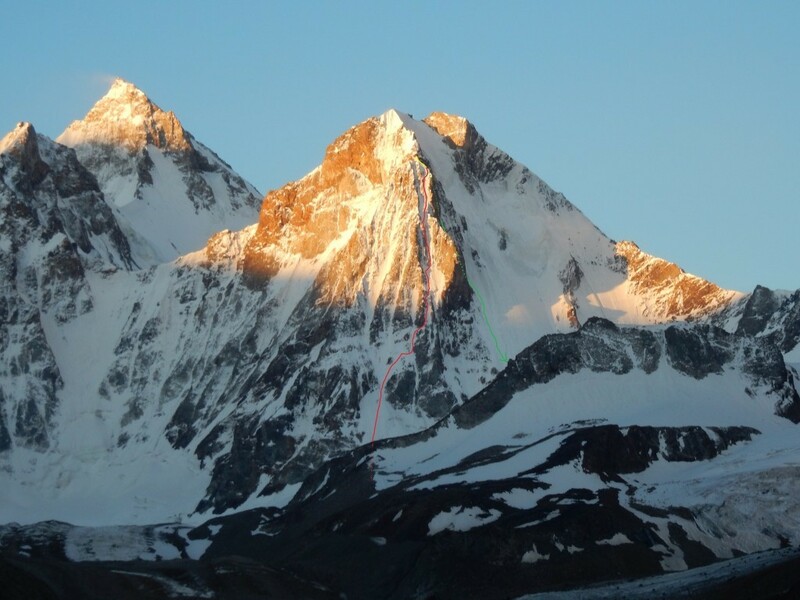 The summit of Muz Tok is 5066m according to the Soviet map but the resolution is not adequate to distinguish which of the closely spaced twin summits this refers to. We have a few other things to report about the area. Firstly, whilst most of the rock in the Jiptik valley is limestone it turns out that the mountains at the head of the valley are mainly granite! Secondly, the start of the 2-day trek into Jiptik is shared with the walk-in to the (relatively speaking) popular area of the Karavshin gorge. In recent years, access to this area has been impeded due to the fact that it involved passing through the enclave of Tajikistan inside Kyrgyzstan, Vorukh. And from time to time (e.g. 2014) there is fighting and the border gets closed. We can report that the tour operator Batken travel service has indeed instigated a new route for the trek into Jiptik and the Karavshin that avoids the need to pass through the Tajik enclave of Vorukh so makes the destination much less risky! Phil and Ciaran managed a 4900m peak which has been climbed previously but unfortunately that was it – a lack of confidence held them back.